As one of the oldest and most respected institutions in Memphis, Christian Brothers High School holds equal parts legacy and promise for the future. To alumni, students, and their respective families, Christian Brothers High School is home. 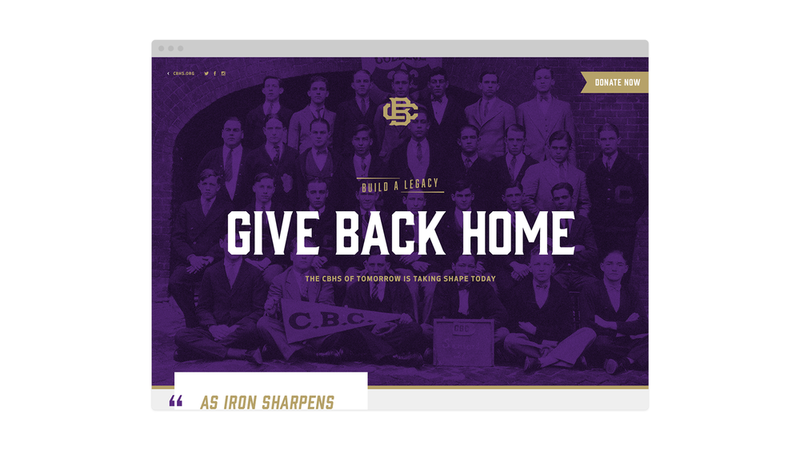 So when Christian Brothers approached us to orchestrate the first phase of the largest capital campaign in Christian Brothers’ nearly 150 year history, we responded with a call to the school’s most stalwart supporters—their alumni, a.k.a. 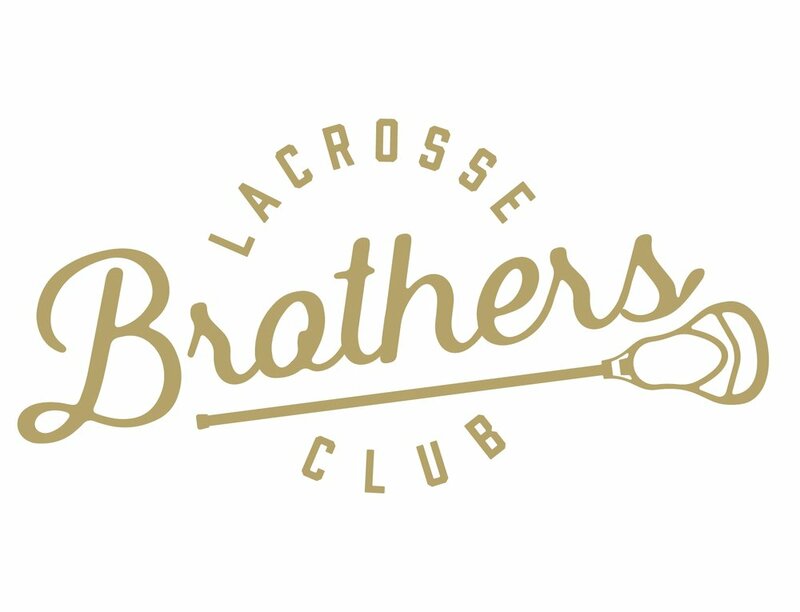 Brothers’ Boys— to Give Back Home. Through extensive discovery sessions, we constructed an ideal donor profile which informed every targeted element of the Give Back Home capital campaign, from video and print collateral to social ad buys. 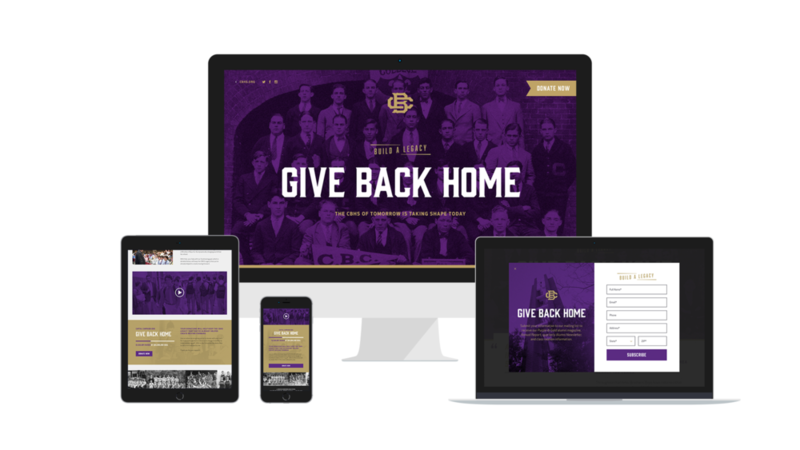 Since the Give Back Home campaign will fund all of the modern amenities and programs for current and future students, we balanced nostalgic imagery and testimonials from hand-selected alumni and former staff with present-day visuals of the school and its students, showcasing the timelessness of the Christian Brothers experience. Through a video campaign distributed via social media and email, we utilized the school’s strong organic reach by highlighting the areas most dear and unique to those who attended the school: the arts, athletics, the burgeoning STEMM program, faith, and— perhaps most importantly— brotherhood. These social media posts and emails led users to the comprehensive Give Back Home website, which highlighted all the areas of giving, as well as the goals of the campaign. We utilized specific development techniques to display a “film strip” of historic pictures to further play on the nostalgic connections their alumni have to the school. To catch the widest spectrum of users, we knew that the giving portal on the website had to be seamlessly integrated and intuitive. 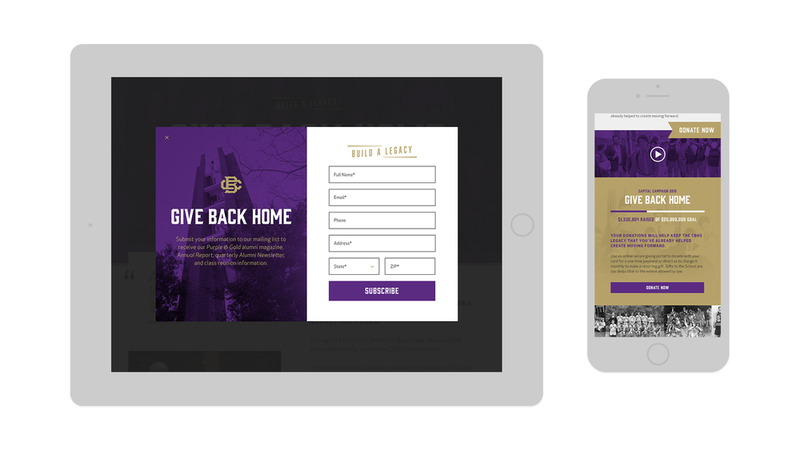 We customized donation software to ensure that Christian Brothers was positioned to maximize the donor’s potential gift and make the giving process as easy as possible. To integrate the timeless look of the campaign into the school itself, we created a new line of merchandise for current and prospective students alike. Christian Brothers wanted the walls of their first physical product of their capital campaign— a state-of-the-art athletic complex— to reflect the school’s singular history and exciting future. For that, we combined timeless iconography, reverent imagery and copy, with modern installation design to carry the new facility through the next 150 years. 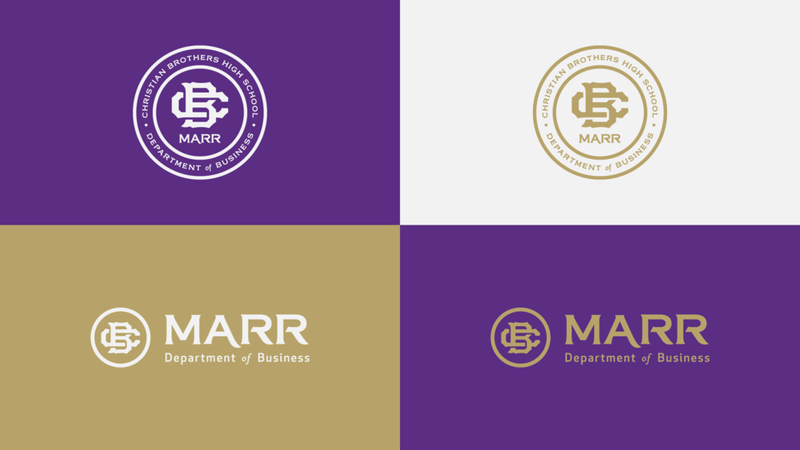 The Give Back Home campaign also allowed the creation of the Marr Department of Business and Economics. In turn, we created a classic crest and identity for the school’s new sector, as well as print content and ads for all of Christian Brothers’ publications.